Nan Houseboat, stationed just outside of Sg Tiang, Royal Belum. We seek refuge from the scorching heat.. before our adventure continues..
After a tough weekend in Rompin. 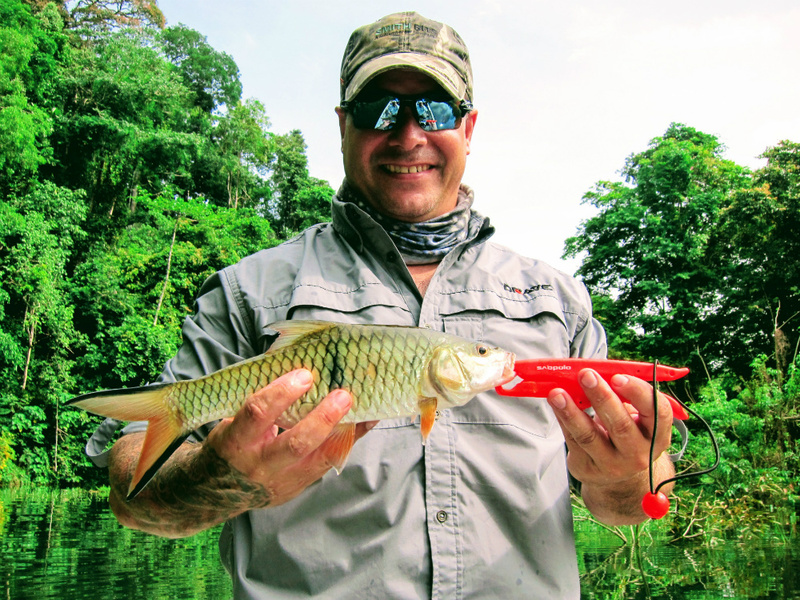 Its time to grab the opportunity to brush it off from my mind and concentrate to maximize the outcome of our freshwater fishing outing with non-other Scott Bremner. It has been more than 6 month since he left Malaysia for his new base in Bangkok. Ultimately, I really look forward to experience a huge step-up over 6 month ago. 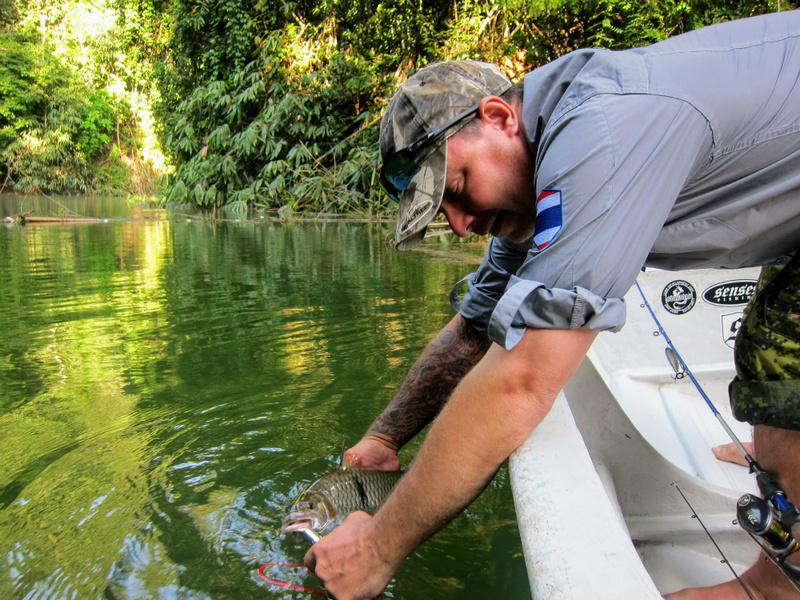 Scott has been practicing every weekend at a local fishing pond that are stocked with Barramundi and Snakehead. 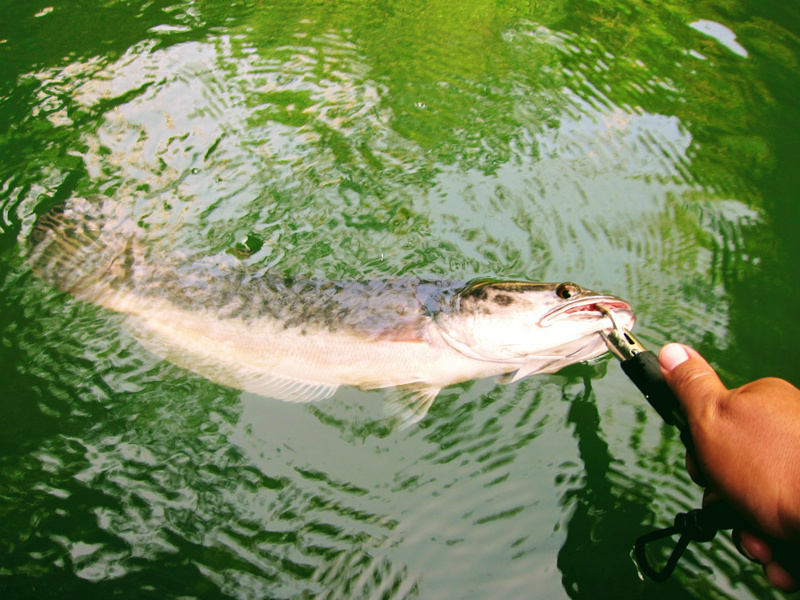 He also have a couple of new setups on his disposal mainly for Sebarau and Giant Snakehead or Toman. Sounded like he has stepped up his game and 3 days out here in Royal Belum will be a great benchmark for him to see how far better than he was out here last time. 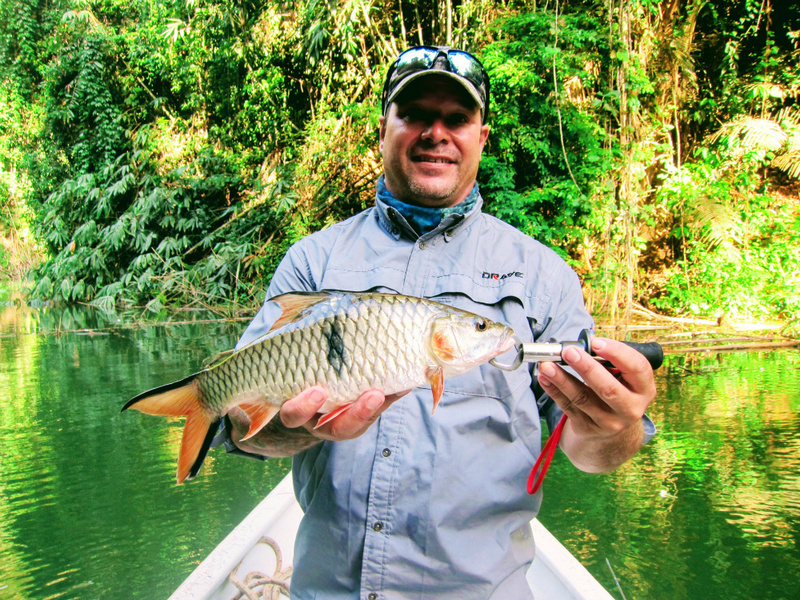 We had some success last month in Kenarong. 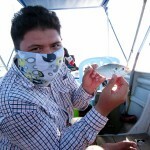 Trolling with deep diver lures 4m and 6m plus lures. It has proven to be effective, as the lure were in strike zone of deep cover Sebarau. We had to do this on our first day. We had a couple of good strike but during the first half of the morning session, only small one showed up. Nothing beyond 30cm specimen. Since the water level was higher in Apr as compared to Mar. The river banks were now totally underwater and the water has risen up until few meters along the tree line. 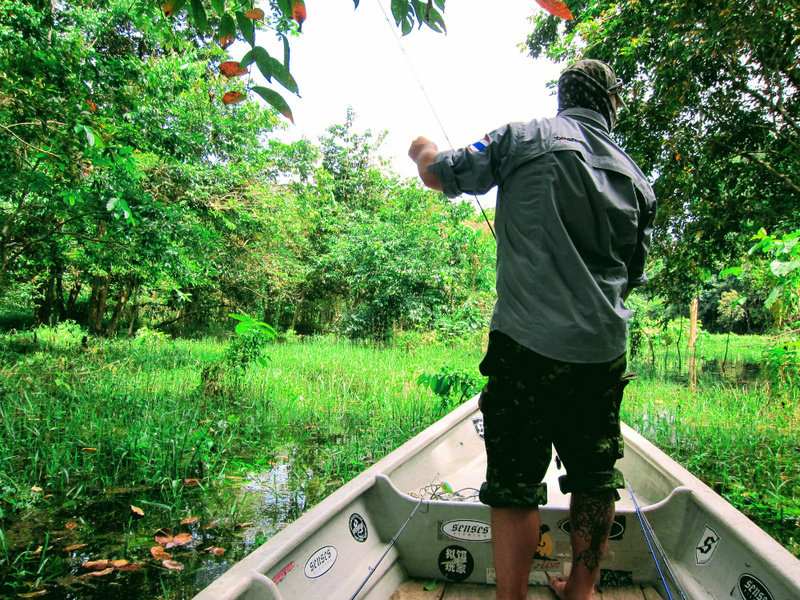 Not even a single Snakehead can be seen and we reckon they were hiding some where closer to the tree line. 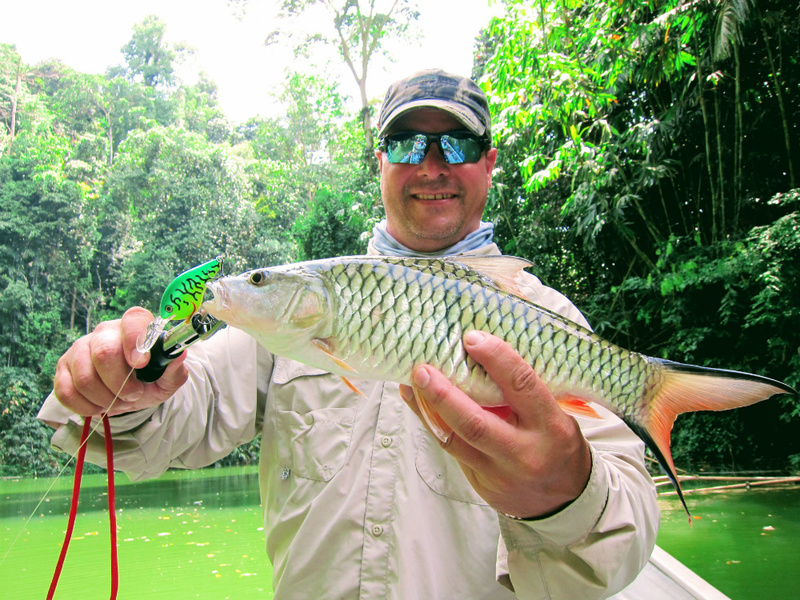 One of my favorite Game Fish of Malaysia. Even at this size, it is still fun to catchem! Scott was already in action from Day 1, Sebarau! We spend most of our time here in Kenarong for Day 1. We head back to Kenarong Base Camp for lunch and a quick rest. We continue to scout the area after lunch, and what we feared has been confirmed. The fish actually dug deep behind the treeline thanks to the rising water level. We literally ventured as deep as possible Fish are everywhere. Especially small Toman. The angle to cast our lure was very limited and narrow. Hardly any room to move. Scott manage to get his jumpfrog deep behind enemy line but the line some how overpass a tree branch. As soon as the lure drops on the water, BOOM!! A fish took it. Hardly any room to strike and fear that abrasion will cut the line. The fish swims away to freedom. We decided to ditch Kenarong and scout other places. We continue to do our trolling with deep diver lures and scored our decent size fish of the day. Its like a bunker here, remain safe for few month. Biggest of the day! 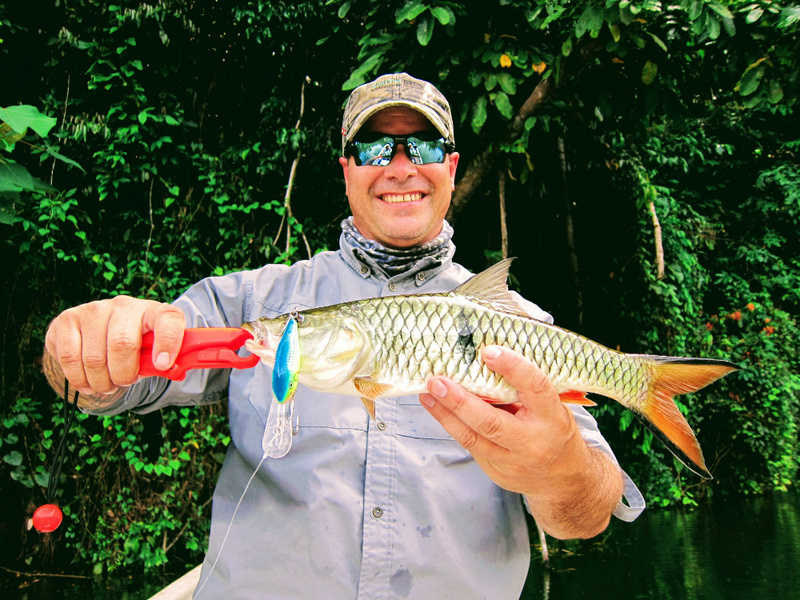 Not afraid to hammer a Rapala Risto Rap 7. Royal Belum is so vast, that almost every corner has a potential predator that might lurk and ready to ambush passing pray or lure. We came a cross a fallen bamboo tree. Instantanoeusly this turns out to be a potential location to throw in our buzzbait. I had one nice places along the fallen bamboo, the buzzing sound and splash were just too annoying for one particular Toman. BRRRRRRRRR, BOOM! It jumps out of the water, trying to grab my buzzbait. It missed! Took a while before trying to take the lure again, this time a big splash just passes Scott’s buzzbait. 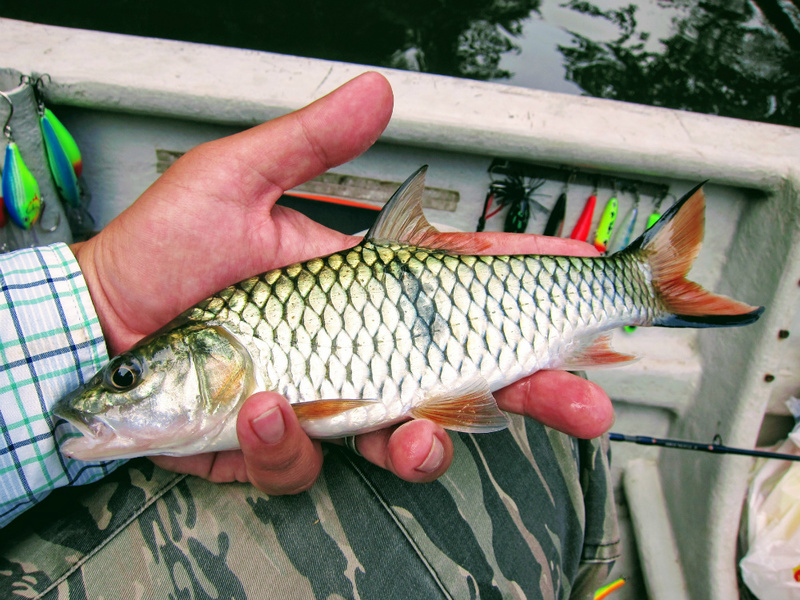 Luckily a smaller Toman took the opportunity and grab his buzzbait. No match for his Extreme Angler Custom Build rod. The game was ended quickly and Scott got his first Toman of the year. 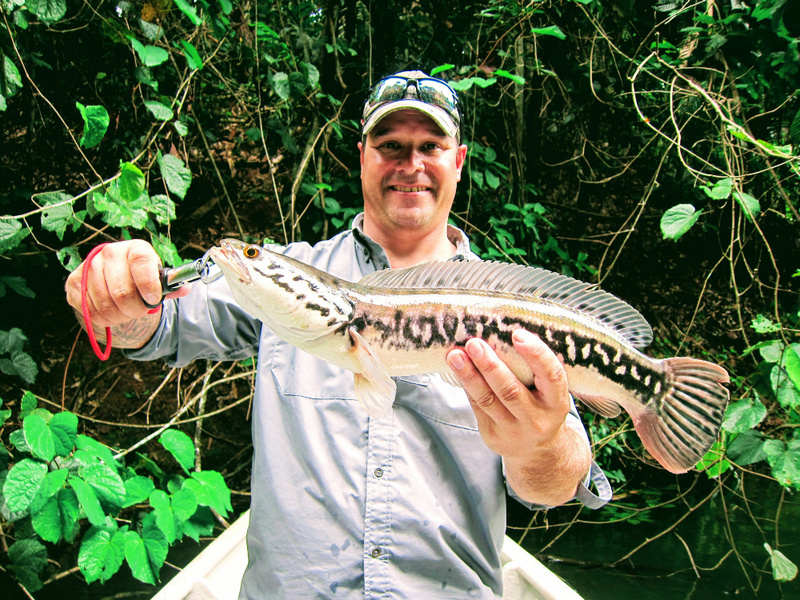 Juvenile Giant Snakehead! fallen for Thai Made Buzzbait. We continue on, venturing different location. 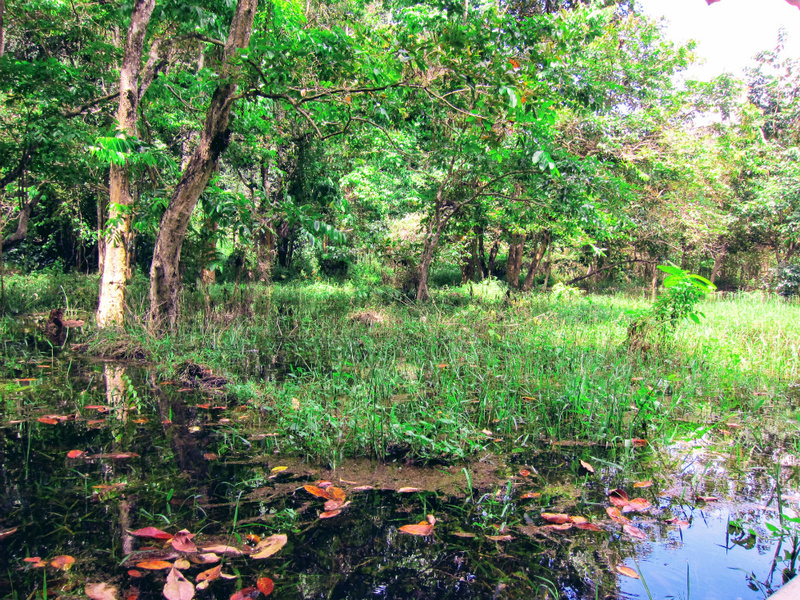 A shallow area, with grass sticking out of the water, has proven time after time that it has potential. I missed 2 good strike on topwater. PokJan however drive a shallow crankbait and was surprised by sudden strong pull. At first we though was a big Sebarau, it is so resilient and not giving up easily. As it was closer to the boat, another juvenile Toman. We stayed on til 8.30pm. Sebarau was getting active during this time period. We only use popper or top water plug. We had a few take but missed, only one small Sebarau were caught on Storm Chug Bug. It was a full day of fishing and it was fun. Still another 2 days to go and hopefully tomorrow will be better. PokJan not missing the fun! Popper are effective against Sebarau, during night time. After a successful day 1, we deviate our path towards south of Temenggor. We can now focus a bit more on nailing those big Toman. Once we reach the spot, it was not what we expected. Fish were there just not really biting. We stopped over some other location but it was all too quite. Instead of wasting time in Temenggor. We decided to cross back to Royal Belum and work our way to cover our loss time in the morning. Pokjan still haven’t showed all his cards and we end-up at a fishing frenzy filled with Sebarau. We made the right choice to cross over again to Royal Belum State Park. It does burn daylight but in the end we are in the right spot. 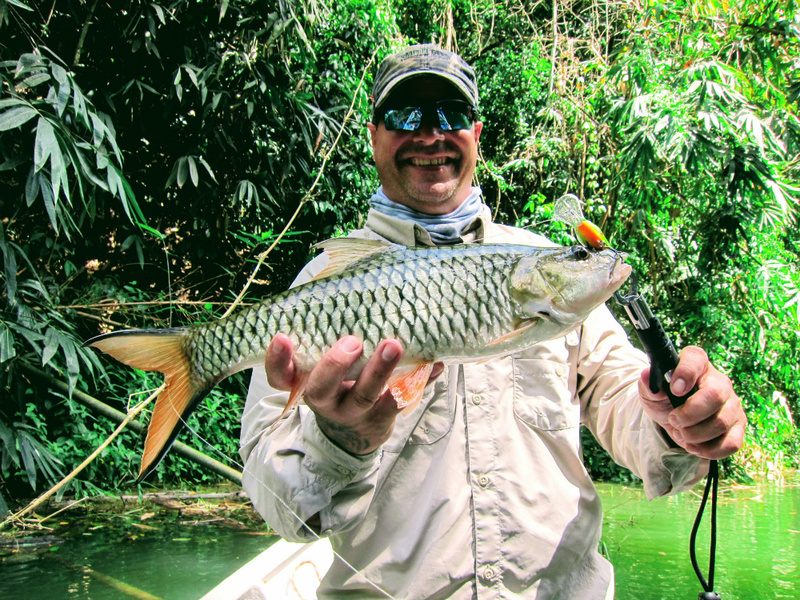 We trolled our way in, and Scott got his deep diver lure hammered by a huge Sebarau! Burn to my eyes haha! As we safely release the first one, seconds cast! BOOM! He was hooked again! Another huge Sebarau! Crazy! Catch and Release! So that we can enjoy it in the future. Back to back trophies for Scott Bremner! Sebarau of Royal Belum! It was awesome afternoon. Fish were really biting and we had em at every cast. We lost a few good take too. 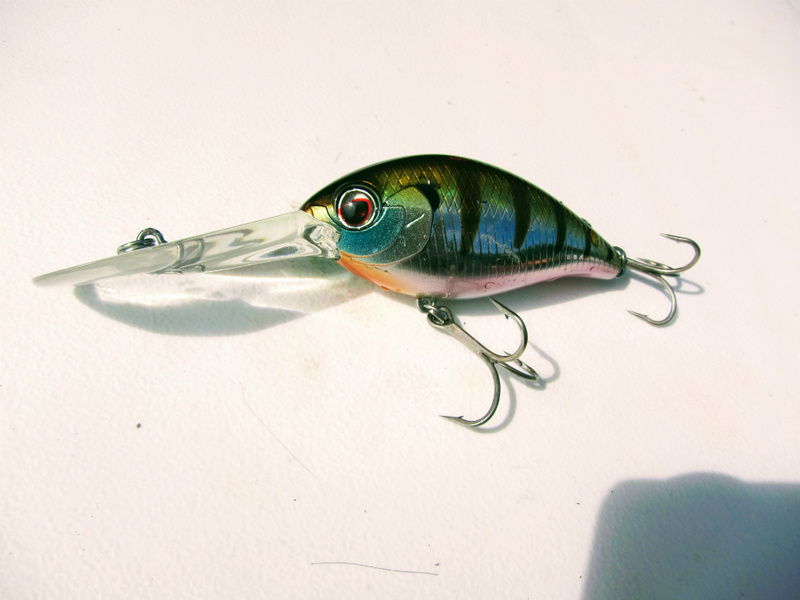 They are not shy to take large divers like the Rapala Tail Dancers and Risto Raps. Scott was nailing them one by one. We tried almost different type of lures and it took it. Proud thing is, we release every single one. We know they are in so much pressure, the least that we can do is give them a fighting chance of survival. 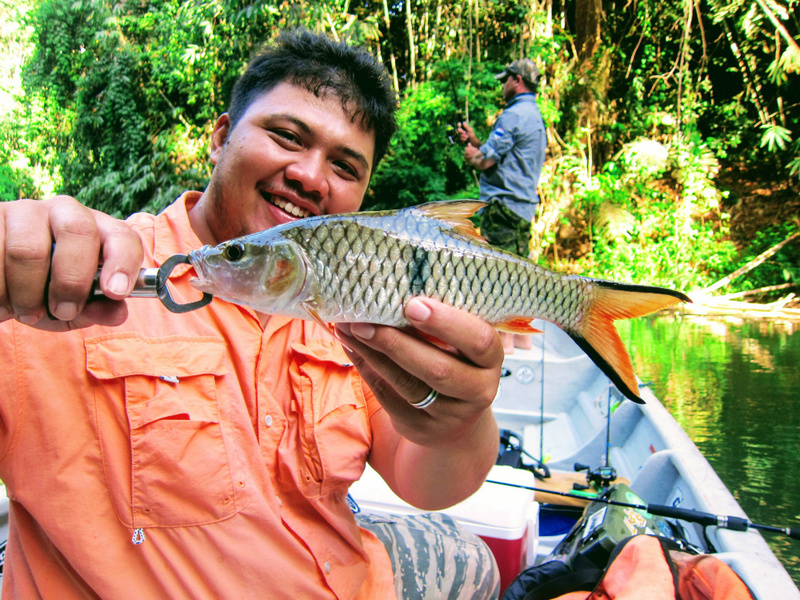 Its an iconic fish, a true Game Fish of Malaysia. At one stage we were tired and the fish stops biting. I think we tagged most of the fish haha. 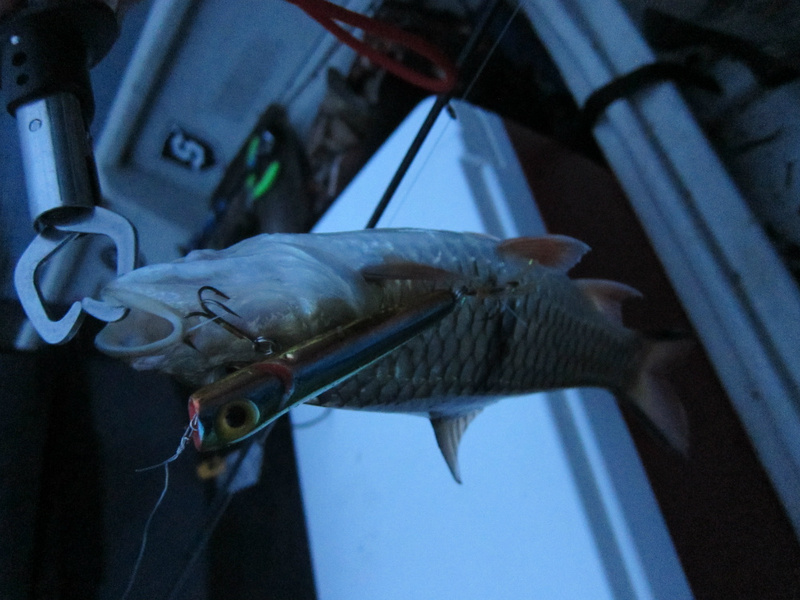 We decided to troll again and this time I was on a Rapala TDD9 Bleeding Hot Tiger. During the first run, it was nothing. As we reach the end, a fish took it. Surely it was a Sebarau. Then all the sudden, I felt a strong dash! Pokjan saw the whole thing, a Toman try too took out a huge Sebarau! I was all shaking, looking at the size of that Sebarau. I did not notice it at the time. 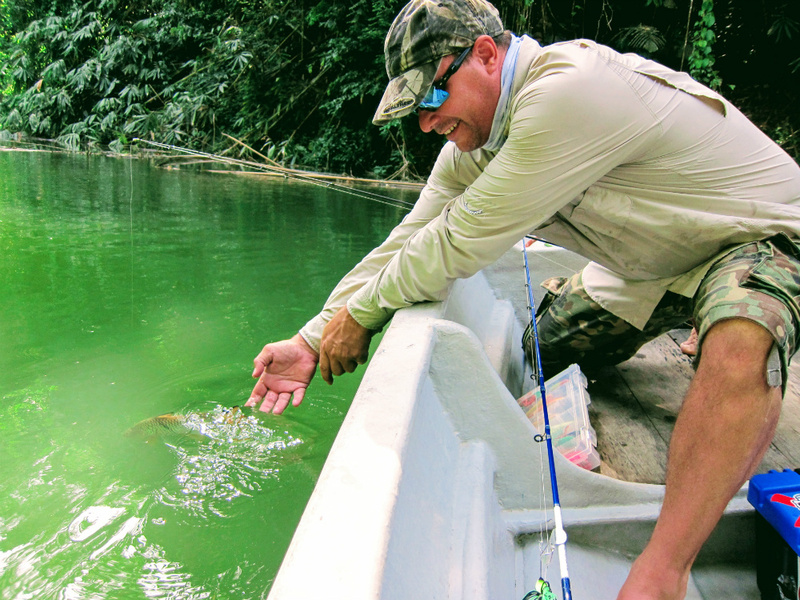 I was still fighting the fish up and it was a Giant Snakehead. It was awesome, before I realize the center split ring is gone. After knowing the whole story, I did felt a bit unlucky but that Toman was being opportunist. What surprises me is the sheer power of the Sebarau. It can just destroy your lure easily. Crunching hooks and stealing it. Awesome fish! I am happy with this baby! But could have been better if its a record breaker size Sebarau. Either way, not complaining. Had a blast here! The rest is history that evening. We ventured out and stick closer the jetty. Hoping to stalk returning Sebarau to their nest. We didn’t hear any fish playing around at that night and we decided to head back home to called it a day. It was been 2 great days and we are hoping to get one large Toman in the bag for Scott Bremner. Catch and Release! Giant Snakehead of Royal Belum State Park. We cross over the Royal Belum State Park in morning. During Scott’s visit to Belum. 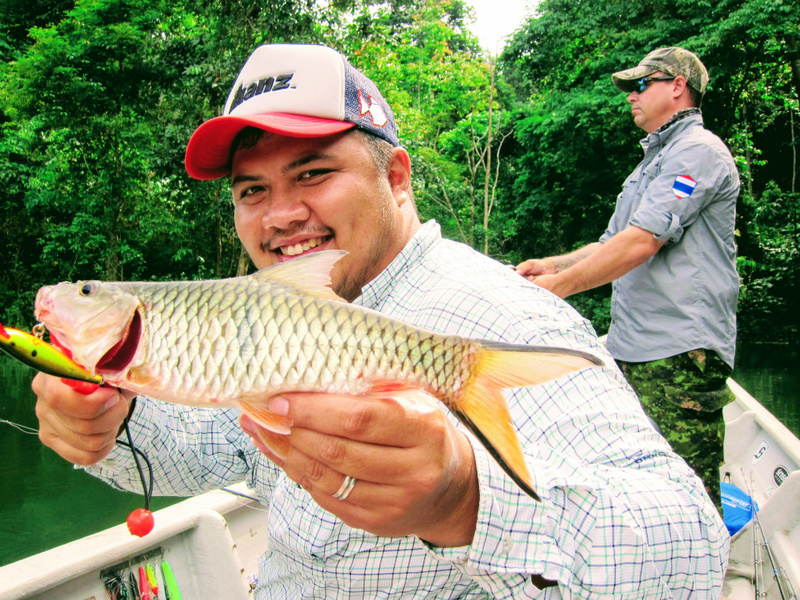 Another trip take place and it was a group of 2 anglers from Japan. 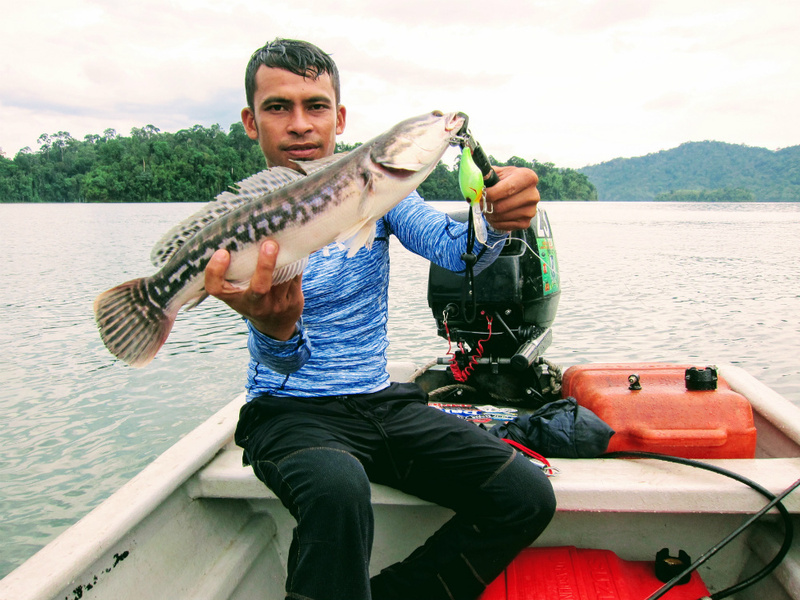 They skunked the last 2 days and they did not catch anything in south of Temenggor. That confirms that the high water level were lowering fish activity down south. We waste no time and head up north. We will scout Sungai Papan on third day. This 3 days was all about Scott showcasing how much he has grown over the past year in becoming a good freshwater fisherman. Has was able to place lures close to strike zone and it tight corners. It takes good determination to be really good with baitcaster and he has showed that it is possible to achieve. We had enough with Sebarau and now to focus 100% on Toman. We ventured into a small straight pathway and at the end of it lies 2 Toman. I think its male and female. A great opportunity to finally score one. Its like penalty kick in football. It doesn’t get any better than this one opportunity. Scott cast his top water lure. Slightly further back from both of those Toman. He worked his way steadily, walk the dog movement and BOOM! Huge topwater splash! I though he got that one, but actually it missed. seconds after the splash, another take but missed too. I couldn’t believe it haha. Wasted two good shots. We ventured out in the open hoping to come across fish fries. We notice several group and finally we are in position and within range to throw in our killer crankbait. Scott was using his new Combat Crank 480. He place the lure perfectly within range. Fast jerk in the beginning and slowly crank it back to the boat. After 2 seconds, the Toman hit the lure. 15-40lb rod bend heavily and the reel were struggling to spill out line. A sign of heavy drag setup. After two cranks it was still ON! but then we say Scott was retrieve it without any resistance. It straighten the standard hook. Unbelievable! Shame, it was a good size Toman. That was our final opportunity with Toman. Scott did hook another Sebarau in Sungai Tiang but that was it. Nothing more can be extract from all location. Overall it was a great outing. One of the best so far for Scott. Thank you for coming to Royal Belum State Park and hopefully we will do better next time. Thanks buddy for coming down all the way from Bangkok! Next round maybe in Thailand. You can count on it.